Azure Service Bus has been the Messaging as a Service (MaaS) option of choice for our enterprise customers. We’ve seen tremendous growth to our customer base and usage of the existing namespaces, which inspires us to bring more features to the service. We recently expanded Azure Service Bus to support all Azure regions with Availability Zones to help our customers build more resilient solutions. 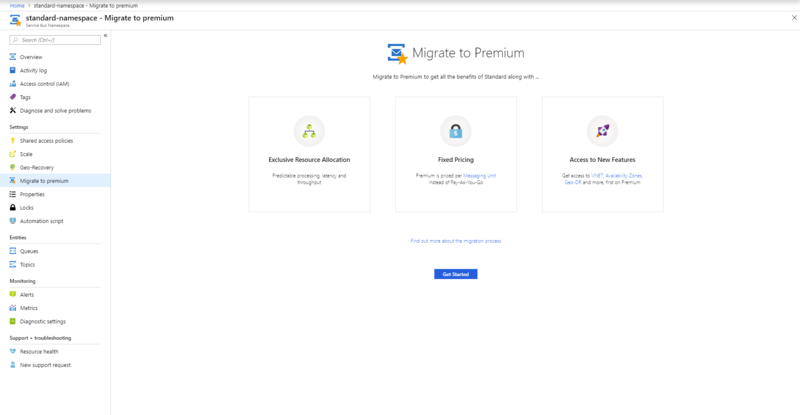 We also expanded the Azure Service Bus Premium tier to more regions to enable our customers to leverage many enterprise ready features on their Azure Service Bus namespaces while also being closer to their customers. The Azure Service Bus Premium tier is a relatively newer offering, made generally available in September 2015, that allows our customers to provision dedicated resources for their Azure Service Bus namespaces. This in turn provides reliable throughput and predictable latency, along with production and enterprise ready features at a fixed price per Messaging Unit. This is a major improvement from the Azure Service Bus Standard tier that is a multi-tenant system optimized for lower throughput systems using a pay-as-you-go model. Our Azure Service Bus Premium tier offering has resonated well with the customers, who have been excited to get onboard to enjoy the value add that it provides. However, until now, we haven’t had a way to upgrade the existing Azure Service Bus Standard namespaces to the Premium tier. That is now about to change. Today, we’re happy to announce tools, both on the Azure portal and via the Command Line Interface/PowerShell that enables our customers to upgrade their existing Azure Service Bus Standard namespaces to the Premium tier. This tooling will ensure that no configuration changes are required on the sender and receiver applications, while enabling our customers to adopt the best offering for their use case, with minimal downtime. To know more about this feature and the finer details on what is happening under the hood, please read the documentation. You can access the portal tool by clicking on the “Migrate to Premium” menu option on the left navigation pane under the Service Bus Standard namespace that you are looking to migrate.